There was a time when homes were uniform in design and had limited access to materials. Now, homeowners have a wide range of options for both style and material when working on their roof. 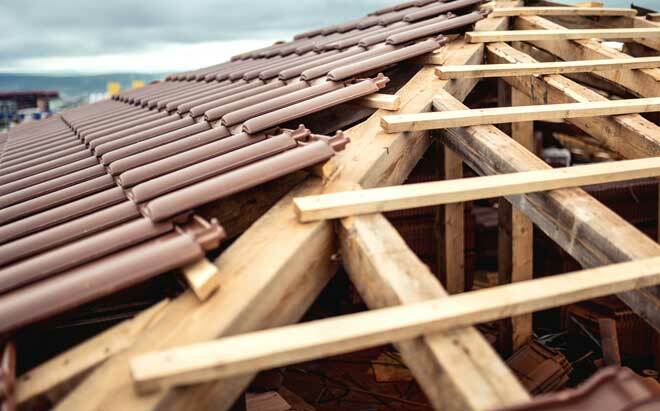 Regardless of whether you are repairing a roof, replacing it, or building an addition to your home, it is important to know the choices available to you as materials are often limited to certain types of roof. When selecting your materials, you may choose to go with a more eco-friendly or cost-effective alternative to your existing roof material. There may be local restrictions preventing you from using certain types of roof or material, so it is best to research building codes if you are not using choices common in your area. The pitch of your roof plays a major role in the available styles and materials. Also known as a slope, there are three different classifications into which roofs are divided. Each slope category has its own advantages and disadvantages, so it is best to consider these factors when planning to build a roof. Any roof with a pitch under 2:12 is considered a flat roof. The space underneath a flat roof has mostly uniform headroom, making it good for garages and modern apartments. Drainage is less efficient on this type of roof, and there may be local regulations addressing this problem. Roofs with a pitch between 2:12 and 4:12 classify as low slope. These roofs provide better drainage at the cost of some headroom in your loft area. Shed roofs, while flat, classify as low slope roofs. Ranging from a 4:12 to 21:12 pitch, steep slope roofs offer the least amount of headroom, but provide maximum water runoff. Steep sloped roofs also support the widest range of materials. There are several common types of roof, each with their own appeal. Depending upon the type of roof on your home, you may be limited to certain materials. When adding on to an existing structure, identifying the style of your existing roof will help keep the addition uniform. This style of roof may be traced back to wooden lodges in the medieval period and possibly earlier, and is becoming popular again. The key advantage of an A-frame roof is that the sides continue to the ground and therefore double as walls. Unfortunately, his also means that the side walls slope in such a way that it reduces headroom. A-frame designs eliminate the need for gutters and help provide protection to your foundation. It may be used for a variety of structures, including cottages, churches, and sheds. Due to the size of the roof, all A-frames are steep sloped. More common in Hawaii than the continental U.S., butterfly roofs are an inversion of the traditional roof with peaks on the outer edges and a central valley where the sides meet. Providing natural light and good ventilation, the butterfly roof is not efficient when it comes to eliminating rainwater. Many buildings with a butterfly roof take advantage of the design to instead collect rainwater for use in drought conditions. Due to their design, flat sloped roofs are considered their own category of roof type. Most commonly found on commercial buildings and modern apartment complexes, they are easy to build and repair. Many green communities are adopting flat roofs for use as garden and recreational space. It should be noted that flat roofs require a special category of roofing materials known as membrane materials. More common in large structures, folded plate roofs resemble a series of gables placed in a row. One of the most common types of roof in the U.S., a gable roof consists of two sloped sides. The term gable refers to the triangular wall at one end of the roof, meaning a gable roof has at least two gables. Cross gable roofs contain one or more additional gables which connect at right angles. A popular variation, the winged gable, extends outwards beyond the roof’s peak. Gable roofs are among the easiest styles to build, making them popular and relatively inexpensive. However, they are not recommended for hurricane-prone areas, as the gables trap wind and may result in the roof being ripped away if the resulting pressure is high enough. Also known as a kerb, these angled roofs are bisected with the lower portion being much steeper than the upper portion. They provide a large amount of loft space and are used for many types of structure, although they are most commonly seen on barns. The hip roof varies from most other types of roof by covering all four sides of a home. These four slopes require more complex support than gable roofs and may cover either a square or rectangular surface. Dutch Hips have a small gable added to two opposing ends, simplifying construction and often providing ventilation. Hip roofs tend to be low sloped. Steep sloped variations include the tent slope and pavilion slope. Mansard roofs are the hip roof’s equivalent to a gambrel, with the lower half being steeper than the upper half. Shed roofs are low sloped flat roofs. Also known as mono-pitched roofs, they may exist as independent structures or an extension of an existing roof with no change to the pitch. Technology has not only made the creation of traditional roofing materials more efficient, it has also created several alternative options which are almost indistinguishable from the originals. As a result, repairing or replacing a roof may not require the same materials used elsewhere to achieve a uniform look. The following examples of common roofing materials are not exhaustive. Likewise, the chart contains average statistics which may be higher or lower depending upon the manufacturer, supplier, and/or contractor. Some examples of other materials, as well as materials designed for flat roofs, are included at the end. Invented in 1893 and first used in 1901, asphalt shingles are the most common form of roofing material. While not the most durable material, they are cheap and fairly resistant to both wind and fire. Modern asphalt shingles have either an organic or fiberglass base and a granuled outer coating which both add color and protects the shingle from damage. 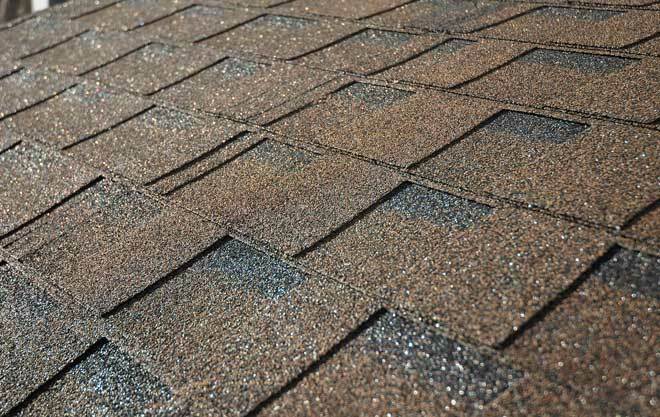 Shingles containing copper or other materials are available in wetter climates to reduce algae growth. Asphalt shingles are available in three-tab or architectural cuts. They are also recyclable, although they are not otherwise eco-friendly. Usable on almost any low or steep sloped roof, most insurance companies will offer a discount if you are using asphalt shingles with a Class 4 impact rating, making this the default choice for most homeowners. Clay and ceramic tiles have been a popular material for centuries, especially in Spanish architecture. These tiles range from flat to S-shaped and are highly resistant to fire. Unfortunately, many tile shapes, such as Spanish or Mission, do not fit together snugly and require some form of backing to improve water resistance with lower pitches requiring more backing. Conversely, the heavy weight of the tiles will affect the way they are fastened. Steeper pitches require more securing, with the steepest requiring each tile to be nailed and possibly mortared. This can drastically affect the price. Low wind resistance further impacts securing requirements in hurricane-prone regions. A modern alternative to clay tile, concrete tile is made from a mixture of sand and Portland cement. These tiles are cheaper than clay, but are otherwise nearly identical in weight, resistance, and usage. As they are baked, they require a high amount of energy to produce, but are all-natural and easily recycled. Concrete tiles can be made to resemble not only clay tile, but slate and wood shake as well. Available in a wide variety of metals, this type of roofing material is available as either sheets or shingles. It is lightweight and resilient, has a long lifespan, and is fully recyclable. Unlike many other materials, metal can be added on top of existing roofs, further reducing cost and landfill. Metal tiles can be painted or coated, although copper tiles are usually left untreated to obtain its characteristic green oxidized color. You may also purchase metal roofing coated in a reflective pigment, which can help lower utility bills. Among the oldest and most resilient options for roofs, slate remains a popular choice among building professionals. Despite being mined, slate requires minimal digging and processing. It is also waterproof and highly resistant to fire, making it one of the most ecologically-sound options. Tiles may be affixed using either nails or hooks, the latter adding extra wind resistance but unsuitably for historic buildings. While sturdy and environmentally friendly, slate is also heavy and expensive. A certified slater is needed to install the material, and tiles are very brittle prior to installation. If you are planning to upgrade to slate, you may also need to have your roof reinforced to bear the extra weight. A growing number of synthetic materials are being used to create lightweight and efficient roofing tiles. One of the more common varieties, plastic polymer, is recyclable and may be used in place of many more traditional materials. As the tiles are molded, they may be shaped to resemble various alternatives such as wood shake or slate. A traditional form of roof covering, wood shingles and shakes have lost most of their popularity due to high cost and susceptibility to fire. Shakes, also known as shag shingles, are created by splitting logs. They have traditionally been used as both roofing and siding material. Shingles, conversely, are made from sawed wood and tend to be less resistant to water and softening than shakes. Modern shakes and shingles are thicker than their traditional counterparts, and shingles may have a rough finish. They both have high aesthetic appeal and are more durable than asphalt shingles, although they tend to require more maintenance. Both variations are available in a range of wood types including pine, cedar, and California redwood. Flat roofs require special roofing materials which vary greatly in durability, resistance, and cost. Rubber, thermoplastic, and modified bitumen have proven more resilient than traditional asphalt and gravel roofs. These materials are rolled out onto the surface of the roof rather than affixed in tiles or shingles. Membrane roofs enjoy an ever-growing number of innovations, making cost and other details highly variable. It is best to shop around if you are considering work on a flat roof to see what materials are available in your area. Canvas or Cloth – This form of roofing material is generally restricted to awnings and retractable roofs. Stone – Heavy and expensive, most forms of stone roofing are unpopular in the U.S. However, varieties such as sandstone and marble are still used in Europe. 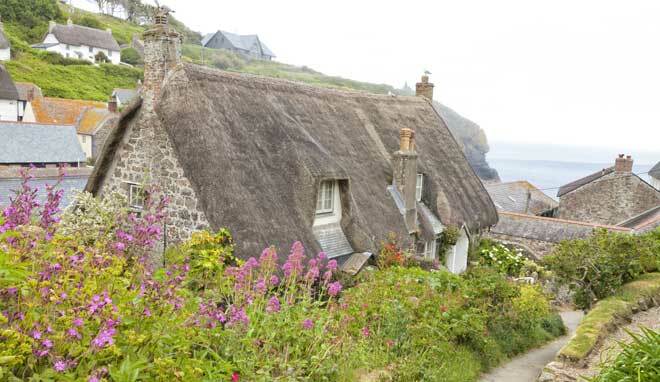 Thatch – Perhaps the oldest form of roofing, thatch is extremely vulnerable to fire and rot. It is also notorious for attracting birds, mice, and insects. Thatched roofs are therefore used mostly in arid, tribal regions and not considered viable for a modern home. Treated Bamboo – This fairly recent alternative is specially treated to be fire resistant. Highly renewable, bamboo has been gaining attention as a durable building material in earthquake-prone regions, but is not yet common in the U.S.
An important consideration when undertaking any home project, the warranties available for your roofing project come in two varieties. Depending upon the roofing job and contractor involved, you may encounter one or both types. Please note that these warranties may not transfer when buying or selling a house. The manufacturer’s warranty covers the materials used, but not the labor. Defective tiles or other problems may be covered. Conversely, the contractor may offer a service warranty which covers the workmanship. In both cases, it is important to read any fine print and make sure that the warranty provider is capable of covering any guarantees contained within. Everybody Needs a Roof is an informational website maintained by the National Roofing Contractors Association. It contains information on roofing systems, installation and repair, and locating certified roofers. The Metal Roofing Alliance maintains a website with detailed information on all aspects of metal roofing. The National Park Service offers an online guide to clay roofs. The Stone Roofing Association offers a guide to stone roofing materials.